You might be confused why I write mostly about BPI. No, I am not affiliated with this bank. I am also not being paid to make these first impressions. It is just that this is the nearest bank to the office and most of the transactions done for the office is through this bank so I always have knowledge about some of their products. Anyways today’s topic is all about the BPI/MS Travel Personal Accident Insurance for those who are applying for Schengen visa or just a regular traveler who would want insurance. This particular product from BPI/MS Insurance Corporation is accepted for Schengen (European Union Member Countries) and non-Schengen (Asia, America and Other Non European Union Countries). The benefits as well as price are also different because of this. The main goal of applying for insurance is to travel at ease. For non-schengen visa this is an option while for schengen visa this is a requirement. 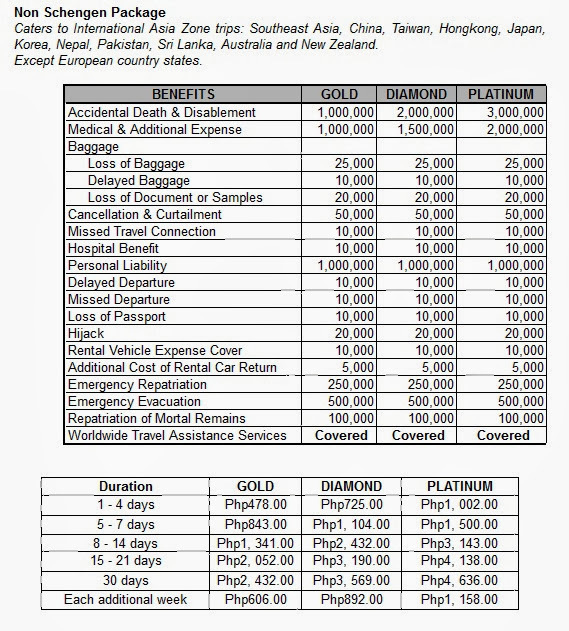 If you have extra money and you may want to apply since this insurance does not just cover accident or death but also include missed flight, lost suitcase and other unwanted occurrences that when you don’t have a reliable travel insurance might cause to ruin your travel plans. 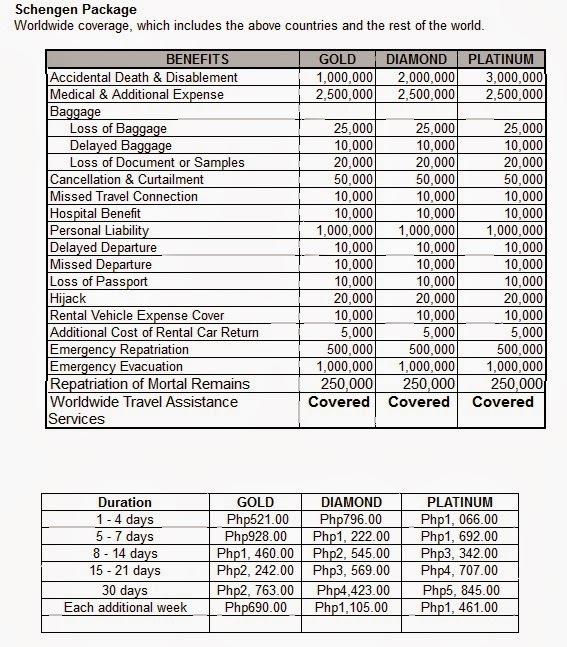 See this table for the comparison of both benefits and price list. This means that the amount you will pay depends on how long your stay will be. To apply all you need to do is visit the nearest BPI branch to your place and ask to whom you can talk about the travel insurance offered by BPI or you can visit the BPI MS Insurance Corporation office at: 11th, 14th &16th Floors, Ayala Life-FGU Center Bldg., 6811 Ayala Avenue, Makati City 1226 and apply directly. Print this form and answer it according to the needed information and attach a photocopy of your passport. Also take note that before you apply for this said travel insurance you have to first have a plane ticket because it is needed in a section of the form. After submitting the form and the photocopy of your passport you will have to wait for the approval of the application. You may either be informed through call or will ask to go again to the office. After approval is the payment for the chosen package and the day after the payment has been made you can get your insurance. These processes are all based on personal experience. It may vary to the branch where you go or the person you have talked to. Hope this post is helpful. Comment below for your opinion and for sharing your own experience. Thanks for informing about travel insurance, but you can compare travel insurance plans and choose the one that suits you best. we offer travel insurance online policy offers cashless hospitalization worldwide. hi gaano katagal to maprocess? Sorry for the very late reply. 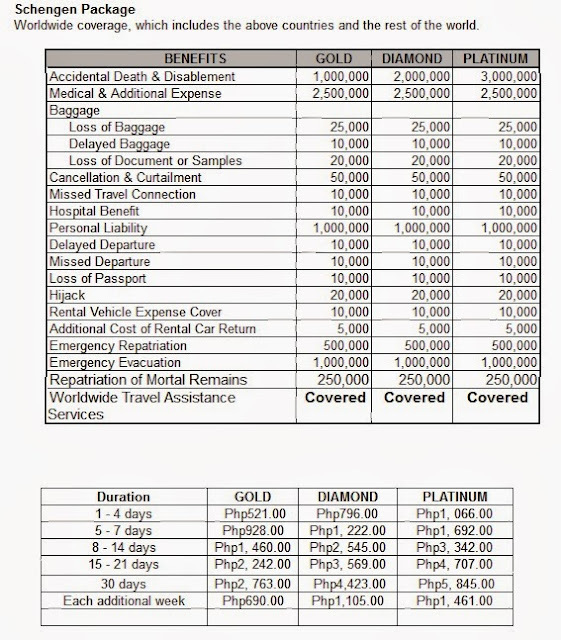 Actually processing of BPI MS Travel Insurance is pretty fast. Priority nila na ma-approve agad. A week or less will do.